The Mueller Report is out. It is all over the news. The mainstream media is trying to find something in it that they can actually use to discredit President Trump; the Democrats in Congress are trying to find something in it that they can use to impeach President Trump. Unfortunately, the circus continues–the main event has moved on, but the clowns remain. Yesterday, Byron York posted an article at The Washington Examiner that reminds us what the Mueller investigation was supposed to be about. …At its heart, the Trump-Russia probe was about one question: Did the Trump campaign conspire, coordinate, or collude with Russia to influence the 2016 election? Mueller has concluded that did not happen. That is definitive. It is not kinda, sorta. It is definitive. As far as Mueller’s conclusions are concerned — and remember, he was long considered the gold standard of Trump investigations — there was no collusion. Other than dealing with the abuse of power by some former high officials in our government, can we please move on now. Yesterday Bryon York posted an article at The Washington Examiner about the upcoming release of the Mueller Report. The article lists five arguments that will not be settled by the release of the report. 1. Collusion. On the face of it, Barr’s summary of Mueller’s conclusion could not be clearer: The evidence gathered by the special prosecutor does not show that the Trump campaign conspired or coordinated with Russia to fix the 2016 election. Barr included two brief quotes from the Mueller report on collusion: “The investigation did not establish that members of the Trump campaign conspired or coordinated with the Russian government in its election interference activities” and “the evidence does not establish that the president was involved in an underlying crime related to Russian election interference.” So on the question: Will Mueller show that collusion occurred? The answer seems a pretty straightforward no. …3. Impeachment. Some Democrats had hoped that the Mueller report would give them cover for impeaching the president. I was undecided, they might say, and then I saw the special counsel’s overwhelming evidence against the president, and I knew it was my duty to impeach. Some of those Democrats also hoped that the Mueller report would serve as a road map to impeachment, in effect doing for Congress the work of discovering and organizing evidence against the president. …4. Investigating the investigation. Many Republicans, long convinced that the Trump campaign did not conspire or coordinate with Russia, have instead sought to uncover the events surrounding the decision by U.S. law enforcement and intelligence agencies to investigate the Trump campaign in 2016. It’s been hard finding out what happened. Rep. Devin Nunes, when he was chairman of the House Intelligence Committee, shook loose a lot of information, but much remains unknown to the public. Now, those Republicans are counting on an investigation by Justice Department inspector general Michael Horowitz to reveal more. And they are hoping that President Trump will declassify documents that could shed new light on the matter. One place they are not looking for answers is the Mueller report. 5. Why a special counsel? Some Republicans question whether there was really a need for a special counsel to investigate Trump-Russia. First, they cite the fact that there was no underlying crime. There was no crime specified in Mueller’s original scope memo, and Mueller could never establish that the Trump campaign conspired or coordinated with Russia. Second, they point to the circumstances of Mueller’s appointment, when fired FBI director James Comey leaked confidential documents in order to set off an uproar that he hoped would result in the appointment of a special counsel. As it turned out, things went according to Comey’s plan. But was a special counsel really necessary to investigate the crime that did not occur? Like so many others, don’t look for that argument to be resolved by the Mueller report. The Mueller investigation cost American taxpayers approximately $31 million. In the end, it proved to be nothing more than a way to keep a number of political people in Washington employed for a while after the administration they supported was not reelected. Far more than a failure of journalism, the Russia collusion narrative was, at its core, a monstrous failure of U.S. intelligence and counterintelligence. All criticism of the news media aside for the moment, the bottom line is that professional journalists received fake intelligence information from U.S. government leakers whom they trusted. That is probably true, but I also think that the personal bias of those individuals reporting the news caused them to believe things that most people would have regarded as totally ridiculous. The entire Russian collusion debacle shows that the American intelligence and counterintelligence processes have broken down. This is a shocking admission from the man who was, at the time, the nation’s highest-ranking professional intelligence officer. Brennan wasn’t indicting just himself. He inadvertently accused the entire CIA. Whatever quality control systems it has, the CIA failed to prevent “bad information” from making its way up the chain to the national strategic level. The article goes on to mention that journalists have learned to depend on leaks from government officials. Leaking classified information is a crime punishable by law. Those leaking need to be held accountable. At the same time, the government needs to be more transparent. A lot of things that are classified are classified to save the government from embarrassment. This leads to the most dangerous conclusion of all. The Russia collusion debacle has shown that the FBI and CIA leadership are not effectively under the oversight of elected officials, but instead are capable of tampering with the American democratic process and constitutional governance. All this must stop. President Trump should assemble a team of solid intelligence and counterintelligence veterans to dig deep into the FBI and CIA leadership, discover the real nature of the problems and devise solutions before our system self-destructs. It’s time to create an intelligence community that is apolitical. I don’t know if that is possible, but it’s a great goal. One America News is reporting today that two Russian air force planes landed in Venezuela’s main airport on Saturday carrying a Russian defense official and nearly 100 troops. This is reported by a local journalist. It sounds as if the Russians are attempting to duplicate what they did in Cuba many years ago, support an unpopular dictator who will be a thorn in the side of America. The Russians have another reason to want to keep Venezuela indirectly under their control. Cuba would have to spend nearly $2 billion a year to meet its domestic oil needs if Venezuela’s National Assembly and interim president Juan Guaidó manage to stop deliveries to the Caribbean island. “Cuba’s demand for oil is about 130,000 barrels per day, and Cuba produces about 50,000 barrels per day, which means a deficit of about 80,000 barrels per day,” said Jorge Piñón, director of the Latin American Energy Program at the University of Texas at Austin. Piñón estimates that Cuba has fuel reserves for about 45 days. But the end of deliveries by Venezuela’s PDVSA oil company would force the government to spend nearly $5.2 million per day at the market price of $65 per barrel for the 80,000 barrels per day it would need to import to meet demand. By the end of one year, that would add up to nearly $2 billion for an economy that economists agree has not reached 2 percent annual growth in recent years and has probably experienced a recession. The National Assembly, controlled by the opposition, recently ordered a suspension of crude shipments to Cuba, which started under an agreement to exchange oil for medical services negotiated by the late Fidel Castro and Hugo Chávez. PDVSA now ships an estimated 40,000 to 50,000 barrels per day to Cuba, not quite half of what the oil company sent before it spiraled into an unprecedented crisis under the Nicolás Maduro regime. There is also another aspect of Venezuela’s oil shipments. On Friday the Associated Press reported that PDVSA, the government-owned oil producer in Venezuela, seized control of two oil rigs owned by a unit of Houston-based Superior Energy Services. The company had shut down the rigs because the Venezuela oil monopoly was behind on payments. Nicolas Maduro, the successor to Hugo Chavez, has not taken over any industries during the six months he has been President of Venezuela. This is the first move he has made in that direction. When Hugo Chavez began taking over industries, one news analyst observed that it would be difficult for him to keep those industries running at their profit levels without the knowledge of the companies that owned them. The seizure of these two rigs, which are repair rigs, is an illustration of that point. Like it or not, free enterprise generates more wealth for more people than socialism. It is a safe bet that oil production is only a fraction of what it was before Maduro took over the oil industry. That adds to the financial woes of Venezuela and will also have an impact of Cuba. Below is a copy of Attorney General Barr’s summary letter to Senator Lindsey Graham, Representative Jerrold Nadler, Senator Dianne Feinstein, and Representative Doug Collins. You can view the letter on Scribd by clicking on the link. Scott Johnson at Power Line posted an article about the letter today. This investigation is the product of a Clinton campaign fabrication. That’s why the investigation was a witch hunt. It is also why the finding of no collusion is unsurprising to anyone who has paid attention with a modicum of impartiality and critical intelligence. The finding of no obstruction is made by Attorney General Barr and Deputy Attorney General Rosenstein. If there was no collusion, they suggest, there was highly likely no obstruction and in fact they find that Mueller did not identify any actions that in the judgment of Barr and Rosenstein constituted obstructive conduct. See page 3, paragraph 3. While investigations and prosecutions will continue for the foreseeable future, we can turn out the lights on the Mueller investigation; the party’s over. Mainstream media hardest hit. One thing to keep in mind is that a team of totally partisan Democrats looking under every rock they could find for two plus years not only could not find evidence of Russian collusion by President Trump, they somehow failed to notice the entanglement of the Clinton campaign in providing a dossier that paved the way for surveillance of a political opponent’s campaign. As the Democrats continue to investigate in the hope of turning public opinion against President Trump before the 2020 election, I hope the American voters begin to realize where the scandal was in this investigation–it wasn’t in the Trump campaign. The National Review today posted an article by Andrew McCarthy about the indictment of Roger Stone. The headline of the article is, “Stone Indictment Underscores That There Was No Trump-Russia Conspiracy.” Since Andrew McCarthy is an experienced prosecutor, he is very familiar with how the law works. Roger Stone is the shiny object. The obstruction charges in his long-anticipated indictment, made public on Friday, are not the matter of consequence for the United States. Nor is the critical thing the indictment’s implicit confirmation that there was no criminal “collusion” conspiracy between the Trump campaign and Russia. What matters is this: The indictment is just the latest blatant demonstration that Special Counsel Robert Mueller’s office, the Department of Justice, and the FBI have known for many months that there was no such conspiracy. And yet, fully aware that the Obama administration, the Justice Department, and the FBI had assiduously crafted a public narrative that Trump may have been in cahoots with the Russian regime, they have allowed that cloud of suspicion to hover over the presidency — over the Trump administration’s efforts to govern — heedless of the damage to the country. So now we have the Stone indictment. It alleges no involvement — by Stone or the Trump campaign — in Russia’s hacking. The indictment’s focus, instead, is the WikiLeaks end of the enterprise — i.e., not the “cyberespionage” of a foreign power that gave rise to the investigation, but the dissemination of the stolen emails after the hacking. And what do we learn? That the Trump campaign did not know what WikiLeaks had. That is, in addition to being uninvolved in Russia’s espionage, the Trump campaign was uninvolved in Julian Assange’s acquisition of what Russia stole. The Stone indictment reads like an episode of The Three Stooges. Stone and two associates — conservative writer and conspiracy theorist Jerry Corsi, and left-wing-comedian-turned-radio-host Randy Credico, respectively denominated “Person 1” and “Person 2” — are on a quest to find out what WikiLeaks has on Hillary Clinton and when Assange is going to publicize it. But that does not suit Stone, who has cultivated an image of political dirty trickster and plugged-in soothsayer. In public, then, Stone pretends to know more than he knows and to have an insider’s view of Assange’s operation; behind the scenes, he scrounges around for clues about what Assange is up to, hoping some insider will tell him. We are not just talking about having our priorities in order — i.e., recognizing that the ability of the president to govern takes precedence the prosecutor’s desire for investigative secrecy. We are talking about common sense and common decency: The Justice Department and the FBI went out of their way to portray Donald Trump as a suspect in what would have been the most abhorrent crime in the nation’s history. It has been more than two years. Is it too much to ask that the Justice Department withdraw its public suggestion that the president of the United States might be a clandestine agent of Russia? It is time to clean house in the FBI and the DOJ–too many people have taken part in this charade to bring down a duly-elected President. Yesterday Fred Fleitz posted an article at The National Review about some recent claims regarding President Trump and Russia (will we ever get past this foolishness?). On Sunday, the mainstream media launched a new ploy to promote their Trump-Russia collusion narrative with a story that first appeared in the Washington Post titled “Officials in dark on Putin talks.” A similar piece was published in the Wall Street Journal on Monday, titled “Trump didn’t use notetakers at Putin/ Meeting.” Cable-news networks and Democratic congressmen claim these stories indicate that President Trump held secret discussions with Russian president Putin that were revealed to no one. For example, Senator Mark Warner (D-VA) told CNN on Sunday that the U.S. government “does not know” what Trump and Putin discussed. It is now clear that these stories were misleading, if not mostly false. First, they neglected to mention that the president’s decision to restrict access to read-outs of his two one-on-one meetings with Putin were due to the extraordinary number of leaks to the press of his phone calls and meetings with foreign officials at the beginning of his presidency. Second, it is untrue that senior officials are unaware of what was discussed in President Trump’s meetings with Putin. Now that we know that President Trump was under surveillance for political reasons by the FBI and the Department of Justice during the early days of his presidency, why are we surprised that he took precautions to make sure he had the privacy presidents are usually accorded. The media’s claim that this story amounts to a U.S. president concealing his secret discussions with the Russian president as part of his alleged collusion with Russia is fake news. Senior U.S. officials knew exactly what was discussed in these meetings. This story is really about a successful effort by President Trump to prevent anti-Trump government officials from leaking sensitive national-security information to the press. After a while, you begin to wonder what President Trump could accomplish if he didn’t have to spend so much time fighting the political establishment, the media, and the deep state. Shoes? She’s Writing About Shoes? It’s my blog, and I can write about anything I want. Yes–I am writing about shoes. Americans are waiting for the other shoe to drop. 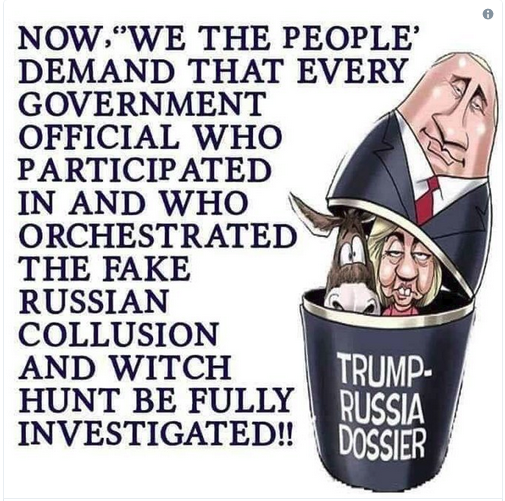 Half of America is waiting for the shoe that says Donald Trump is a Russian agent planted in the White House, and half of America is waiting for the shoe that says the Obama administration misused government for political purposes and that abuse is continuing under the guise of the deep state. Only one side of this debate has actual evidence (even though much of it has been erased, gone missing, or willfully destroyed–which in itself is telling), so what has the other side got? On Sunday The Washington Post posted an opinion piece with the title, “Here are 18 reasons Trump could be a Russian asset.” Some items listed were pulling troops out of Syria, doing business with Russia for years, Russians interference in the 2016 election to help President Trump get elected (so far no evidence of that), candidate Trump encouraging Russia to hack into Hillary’s emails (they already had, and he was joking), Paul Manafort owing a Russian oligarch money, President Trump firing James Comey (something the Democrats had previously recommended and Rod Rosenstein wrote the letter for), and President Trump citing the corruption in the FBI and DOJ–the charge is that President Trump has undermined these organizations by citing corruption (how about the leadership undermined them when they allowed them to be used for political purposes). This is hardly a “beyond a reasonable doubt” case that Trump is a Russian agent — certainly not in the way that Robert Hanssen or Aldrich Ames were. But it is a strong, circumstantial case that Trump is, as former acting CIA director Michael Morell and former CIA director Michael V. Hayden warned during the 2016 campaign, “an unwitting agent of the Russian federation” (Morell) or a “useful fool” who is “manipulated by Moscow” (Hayden). If Trump isn’t actually a Russian agent, he is doing a pretty good imitation of one. Last time I checked, you couldn’t convict someone on the basis of your opinion or simply because he won an election. The argument for this shoe seems to be rather weak. I will discuss the other shoe in my next article. Have We Truly Lost A Government Where All Men Are Equal? Victor Davis Hanson posted on article at American Greatness yesterday which illustrates what has happened in America over the past decade or so. Anyone reading this scenario realizes that after doing all this, they would be sitting in a jail cell hoping someone would bake them a cake with a file in it. The article goes on to list the various misdeeds of government officials in the past two or three years. It’s a well-known list–you can follow the link to the article to read it. But somehow no one is in jail. To this day, we have no idea which officials in government leaked the unmasked names of surveilled Americans to the media, or leaked the transcripts of a conversation between the Russian Ambassador and Gen. Michael Flynn. I say we have no idea, because no one in government has any interest in finding out, because for the few, who might, to do so would earn them media and partisan venom. The message from the Clinton email scandal, the Mueller investigation, and the careers of Brennan, Clapper, Comey, and McCabe seems to be that if the government wishes a document then do not provide it. If you are finally forced to surrender it, either erase or destroy what you can reasonably get away with hiding. Or barring that, insist that it be heavily redacted, according to your own judgment, for the sake of America. If asked to explain such behavior or allegations of leaking information to the press, either deny or claim faulty memory. Do all of that and be of the correct political persuasion and of Washington repute, and there is little chance of criminal exposure. We will not have equal justice under the law until all lawbreakers are prosecuted, regardless of their political standing. Yesterday The Washington Examiner posted an article about what the Republicans have accomplished in informing Americans about the misuse of government agencies in surveilling the Trump campaign and the Trump administration. The article lists what we know as a result of the work of the House Intelligence Committee. 1) The important role that the incendiary allegations in the still-unverified Trump dossier played in the FBI’s investigation of the Trump campaign. 2) The fact that the dossier was commissioned and paid for by the Hillary Clinton campaign and the Democratic Party. 3) The unusual circumstances surrounding the formal beginning of the FBI’s counter-intelligence investigation into the Trump campaign. 4) The troubling deficiencies in the FBI’s application for a warrant to wiretap onetime Trump campaign figure Carter Page. 5) The anti-Trump bias of some of the top officials in the FBI investigation. 6) The degree to which the dossier’s allegations spread throughout the Obama administration during the final days of the 2016 campaign and the transition. 7) Obama officials’ unmasking of Trump-related figures in intelligence intercepts. 8) The fact that FBI agents did not believe Michael Flynn lied to them in the interview that later led to Flynn’s guilty plea on a charge of lying to the FBI. 9) The role of the opposition research firm Fusion GPS in the Trump-Russia probe. There is more. The article notes that the FBI and Justice Department fiercely resisted the investigation. They withheld materials, dragged their feet, and flat-out refused to provide information to which congressional overseers were clearly entitled. None of this has been bipartisan. The work has been done by Republicans and opposed by Democrats. And if Democrats win control of the House, as a number of polls suggest they will do, it will stop immediately. If Democrats win, Rep. Adam Schiff, who has opposed nearly everything Nunes has done, will become chairman of the Intelligence Committee. Rep. Jerrold Nadler will head the Judiciary Committee. And Rep. Elijah Cummings will take over the Oversight Committee. The Judiciary and Oversight Committees would also abandon their current paths and focus directly on the president. There are legitimate concerns about the use of government agencies to spy on a political opponent. It is unfortunate that the Democrats do not seem to share this concern. If the Democrats gain control of the House of Representatives, the political abuses of government agencies will continue. At that point we will lose the concept of ‘equal justice under the law.’ We will be on our way to becoming a nation where your politics matter more than your guilt or innocence.